If you’re craving noodles, Tam Noodle Box has you covered. Sometimes you just crave noodles. Maybe you’re looking for sweet-and-spicy pad thai, with those long, thin rice noodles. Or maybe egg noodles are your jam, and you’re dreaming of a simple chow mein. Meanwhile, your friend wants udon. Tam Noodle Box has you covered. Opened near Seattle University and the hospitals two months ago, on the corner of Jefferson Street and Broadway, this restaurant has wok-tossed noodles of all kinds. They’re served in traditional folded to-go boxes (hence the name), complete with cute instructions on how to turn the box into a plate. It’s family-owned, from the same people behind Seattle Pho + Bar downtown. The big, bright space is decorated heavily with those same little to-go boxes. Order at the counter, over which is a big chalkboard menu and Hollywood-style light-up letters spelling out the restaurant’s name. Then easily take it to-go, or there’s ample seating to hang out. The menu: Pan Mee. Spinach Noodles. Hokkien. Udon. Rice noodles: wide, flat and thin. They’re not kidding about the noodles. Pick your sauce (creamy peanut, coconut curry, garlic black bean), your noodle and your protein (chicken, pork, fried tofu, beef or shrimp). Rice is available with some dishes, or there’s a fried-rice option. And starters abound: egg rolls, crispy tofu, popcorn chicken, salad, edamame. What to try: Tam’s Pho has no broth. Instead, a reduced pho-flavored sauce dresses flat rice noodles with bean sprouts and lime, a delicate flavor, with a hint of star anise. 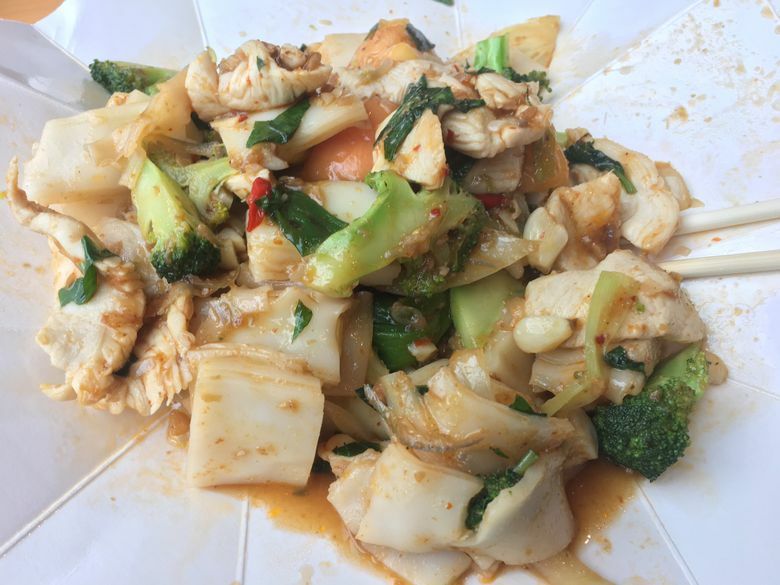 Don’t fear the Drunken Noodles; advertised as “very spicy,” they were underwhelmingly so. The wide, flat rice noodles came in little square stacks, rather than the long strips you may imagine. The longer they sat, the squishier they became. But it all tasted bright and fresh, tossed in a garlic-honey sauce. Wash it all down with a Thai iced tea, Vietnamese coffee or a variety of milk teas. Or a beer, they do serve alcohol. What to skip: If you’re interested in the popcorn chicken for its advertised five-spice batter, go another direction. It’s a good white-meat fried chicken snack, but the five spice is undetectable. Instead, munch on some classic fried chicken-and-vegetable potstickers. They’ll hit the spot. A tip: Portions are pretty large, so think twice before you unfold your takeout box completely to make it a plate. They do refold better than you may expect. Prices: Drunken noodles with chicken ($10), Tam’s Pho ($10), potstickers ($6), popcorn chicken ($6), Thai iced tea ($4) and Viet coffee ($4) totaled $40, before tax and tip, and fed two with tons of leftovers.